This Italian Grinder from D’Agostino’s is available darn close to my home, so I will never go hungry. 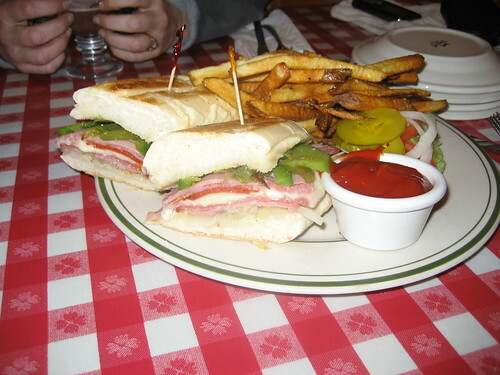 At $6.95, this oven baked sammy with ham, capicola, salami, pep, sauteed green peppers/onions, provolone, and Italian spices….is more than a few tasty mouthfuls. And that doesn’t even include the rockin’ fries. That’s a lot of food for a small price. I’m huge fan of D’Agostino’s pizza and this grinder proved that they are good at more than just pizza. But D’Agostino’s is one of those pizza places that has burgers. What’s with that? Do people actually go into places like D’Agostino’s, Leona’s or Father and Son to order a burger? You could, because they all have them. I can safely say that I’ve never ordered a burger in a pizza place. Their pizza rocks, so why do it? But maybe I need to try. Maybe that’s a whole new category for Tasty Chicago…pizza joints with good burgers. I don’t know, I’m not buying it. Getting a burger at a pizza place would be kind of like going to Nordstrom to get some golf shoes. Sure, there’s a good chance that Nordstrom is going to have a bevy of fine golf shoes, but you just don’t buy them there. You just don’t do it! It’s stupid! You go to a golf shop or some other purveyor of golf equipment to buy golf shoes. Okay, forget about the golf analogy. Would you go to an Ulta to buy bath salts? No, damn you! You go to Bed Bath and Beyond to buy bath salts. I mean, its B3, they have the word bath in their name. Right? Help me out here, someone. Posted in food on 2007/04/26 by John.